This photo gallery showcases our delicious cuts of steak and upscale Southern food in Atlanta, including the Southern staple, shrimp and grits in Atlanta. 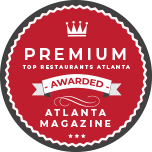 Our restaurant takes pride in serving up some of the most delicious succulent steaks in Atlanta, GA, as well as upscale Southern food including shrimp and grits. Check out our photos of some of our most popular dishes and then get in touch with us to make a reservation for your group. When you’re looking for great food and time spent with friends and family, why not make a reservation at our restaurant? 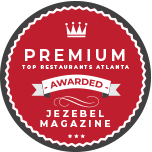 We serve some of the best Southern food, burgers, and succulent steaks in Atlanta, GA. All our steaks come from top-quality, certified choice beef that has been aged for at least 21 days to ensure flavor, tenderness, and the quality our customers expect. Whether you’re enjoying a center-cut filet with our signature steak sauce and oven-roasted mushrooms, garlic-sautéed shrimp and cheddar grits, or a lamb burger with Vermont white cheddar and garlic cilantro fries, you’re sure to have a meal you’ll remember for ages. Whether you’re a long-time Atlanta resident or you’re here on vacation or business, our upscale Southern food is sure to please your taste buds. We specialize in creating upscale versions of popular Southern dishes like shrimp and grits, smoked fish and ribs, fried green tomatoes, and lobster tail. In addition to our extensive menu at our restaurant, we provide catering services throughout the area. Share your favorite flavors with guests at your special event, whether it’s a wedding, corporate event, or birthday party. When you visit our restaurant, you can count on more than great, upscale Southern food. We’ve made it our goal to create an atmosphere that promotes good times, great conversation, and memorable events for every guest. Our restaurant has private and semi-private dining spaces for special events, and our general dining area is decorated tastefully and comfortably. In addition to great food, we stock an extensive wine list and can make informed recommendations with your meals. Contact us today at (404) 525-3399 to make a reservation. We are proudly located in Atlanta, Georgia.